Probably the most predictable restaurant on this list, Be Our Guest has been one of the most popular restaurants on property since it opened. And with good reason! Guests will be in awe of the elegant Grand Ballroom, the moody and dramatic West Wing, and the romantic Castle Gallery. And once you choose a room to eat in, you’ll enjoy a variety of French-inspired meals and even have the chance to try the “Grey Stuff”! 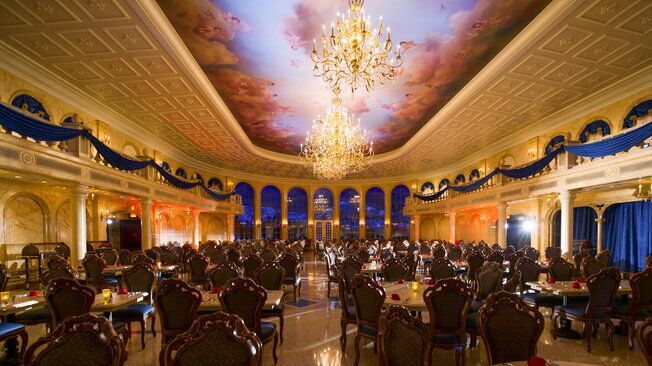 Be Our Guest is open for breakfast, lunch and dinner, and this is the only place on Disney property where you can meet the Beast (after dinner reservations only).